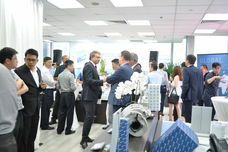 On 9 October, Motorservice celebrated the official opening of its new subsidiary in Singapore with 30 selected customers. MS Motorservice Trading (Asia) Pte. Ltd. began trading back on 1 July 2018. The celebrations have now taken place in October as the symbolic start signal for a more intensive customer service in the Southeast Asian region. “As you see, we have offices equipped with state-of-the-art equipment here and an optimally functioning infrastructure − and this was made possible thanks to the active support from our colleagues from Rheinmetall Defence. We benefited from the experience within the group and were able to start operative business quickly thanks to the minimal bureaucratic and administrative requirements”, thanked Tobias Kasperlik, Chairman of the Board at Motorservice, in his welcome speech to the colleagues from Rheinmetall Defence who attended the celebrations. Rheinmetall has had offices in Singapore for years, where the Aftermarket Division is now using office space for four people. 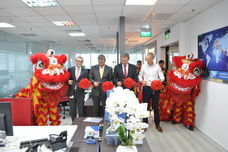 After a traditional Chinese lion dance, carried out as a ritual to bring luck at weddings, New Year celebrations and openings of important buildings, Ulrich Gnädinger, Vice President Sales at Motorservice, emphasized the importance of MS Motorservice Trading (Asia) Pte. Ltd. for the activities of the spare parts specialist in Singapore and Malaysia in his speech: “The ASEAN countries are an extremely important growth region for us. Which is why, with the new company headed by Dr. Oliver Lazar, we aim to be closer to our customers from our base in Singapore, so that we can provide an even more personal and intensive service”. 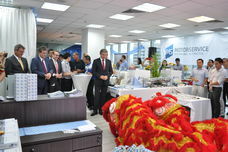 With the impressive opening ceremony, Motorservice has made a promising start to achieving this goal.